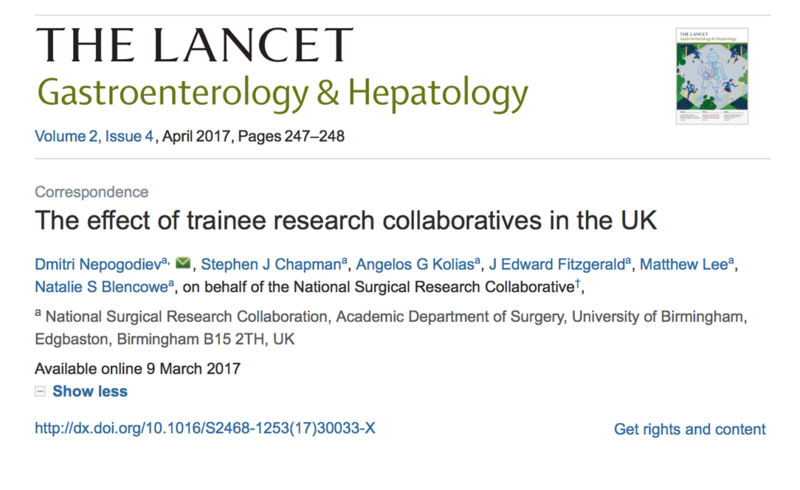 The effect of trainee research collaboratives in the UK. Lancet Gastro Hep. 2017;2:247. Aswin Chari, Aimun Jamjoom, Angelos G Kolias (British Neurosurgical Trainee Research Collaborative); Veeru Kasivisvanathan (British Urology Researchers in Surgical Training Research Collaborative); Marta D’Auria, Gael R Nana, Tanvir Sian (East Midlands Surgical Academic Network); Neil Sharma (ENT West Midlands Trainee Research Collaborative); Aneel Bhangu, J Edward Fitzgerald (GlobalSurg Collaborative); James Haddow, Nicholas RA Symons, Sarantos Kaptanis (London Surgical Research Group); Pete Coe, Nicholas A Heywood (North West Research Collaborative); Deena Harji, Fadlo Shaban (Northern Surgical Trainees Research Association); Gijs van Boxel, Jennifer Isherwood (Oxford Surgical Collaborative for Audit and Research); George Murphy, Katie Young (Reconstructive Surgery Trials Network); George Ramsay, Nicholas T Ventham (Scottish Surgical Research Collaborative); Natalie S Blencowe (Severn and Peninsula Audit and Research Collaborative); Matthew Lee, Alex Ward (South Yorkshire Surgical Research Group); Thomas M Drake, James Glasbey, Chetan Khatri, Dmitri Nepogodiev (Student Audit and Research in Surgery Collaborative); Joseph Shalhoub (Vascular and Endovascular Research Network); Rhiannon L Harries, Amy Stimpson (Welsh Barbers Research Group); David Bartlett, Ewen Griffiths, Paul J Marriott, Thomas D Pinkney, Pritam Singh, Ravinder S Vohra, Richard Wilkin (West Midlands Research Collaborative); Stephen J Chapman (Yorkshire Surgical Research Collaborative). 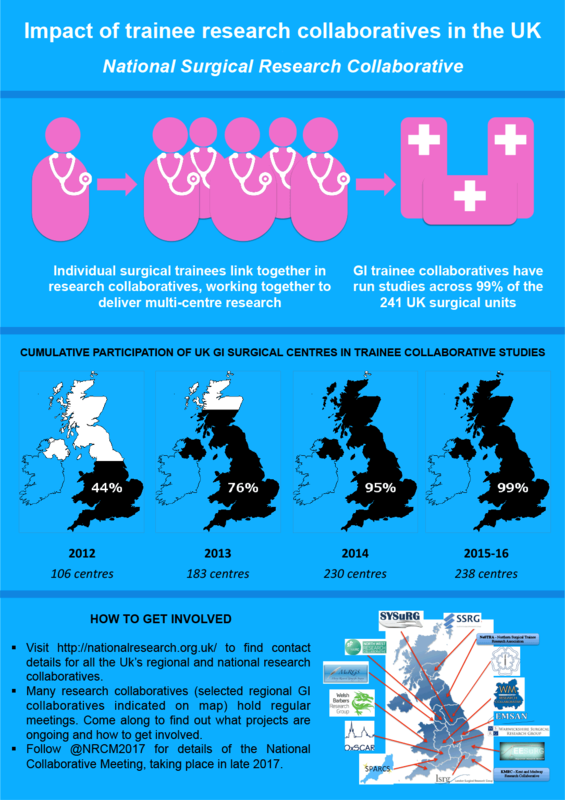 Home » Portfolio » The effect of trainee research collaboratives in the UK. Lancet Gastro Hep. 2017;2:247.